Do you want to know how to get a discount on a swim with dolphins? Find all the information here! Cancun is the ideal destination to make your dream come true; experiencing a swim with dolphins is an activity that you must do at least once in a lifetime and, if you’re vacationing in Cancun, you can get a discount to finally do it! However, you may not know which swim with dolphins is better to fulfill your dreams. If you’re in this situation, you probably want to analyze which style matches better with your personality. Just click here. Once you’ve chosen the ideal swim, it’s time to get your discount! Where to find a 30 percent discount for a swim with dolphins? You don’t need to look any further, since you’ve already found it! In this place, you can choose between Primax, Interax and Dolphin Ride. If this weren’t enough, food and beverages as well as the entrance to the park are included, thanks to an all-inclusive package to Xel-há. This park is combined with the Mayan Riviera habitat and you can do the amazing Primax4 swim here. Also, you will have free transportation and all the activities included in Xplor Park. This is an awesome adventure for those who would like to swim in underground rivers or throw themselves in zip lines. Get now your 30% discount! If your perfect swim with dolphins is Interax, then this is the perfect choice for you, since the package not only includes your swim but also free transportation, one meal and beverages and access to all the activities in this park. Just look for the all-inclusive package in Xcaret. However, if you were thinking about The One, Couples, Splash or any other swim, don’t worry, because you can also find discounts for these experiences in which you will fulfill your dream of swimming with dolphins! 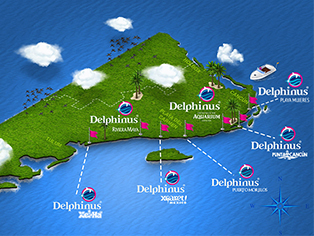 Plan your vacations in advance and enjoy your swim with dolphins!